In a deep bowl, mix cayenne pepper, salt, paprika, black pepper and olive oil. Add pork to bowl and mix well to coat. Heat canola oil in a large skillet over medium to high heat. Add pork and cook until nicely browned, approximately 1 to 2 minutes per side. Add apple juice, orange juice, syrup and vinegar to pan. Bring to boil, scraping any browned bits. Reduce heat to medium, until the sauce is reduced to a thick glaze, approximately 1 to 3 minutes. Sauté all ingredients in a pan with 2 tablespoons of olive oil until vegetables soften. Add black-eye peas, broth and salt & pepper. Cover and simmer until peas are tender. 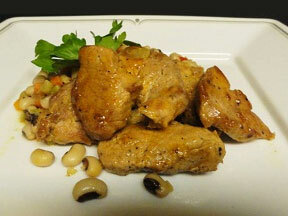 Serve with pork medallions.